Nissens explains the relationship between intercooler failure and turbocharger damage. All modern diesel cars are mounted with an intercooler. The intercooler significantly improves the combustion process in turbo-charged systems, thus increasing the engine power. The main role of the intercooler is to reduce the air temperature after it is compressed by the turbocharger and before it reaches the engine’s combustion chamber. This has a significant impact on the charge effect, as the cooled air has a much higher density in terms of air molecules per cm3. This increases the amount of intake air, resulting in a far better engine output. If the system pressure is too high, it can cause deformation of the plastic tank. Intercooler failure is often linked to turbocharger damage. Replacement of the turbocharger introduces several risks, if not carried out according to installation guides. 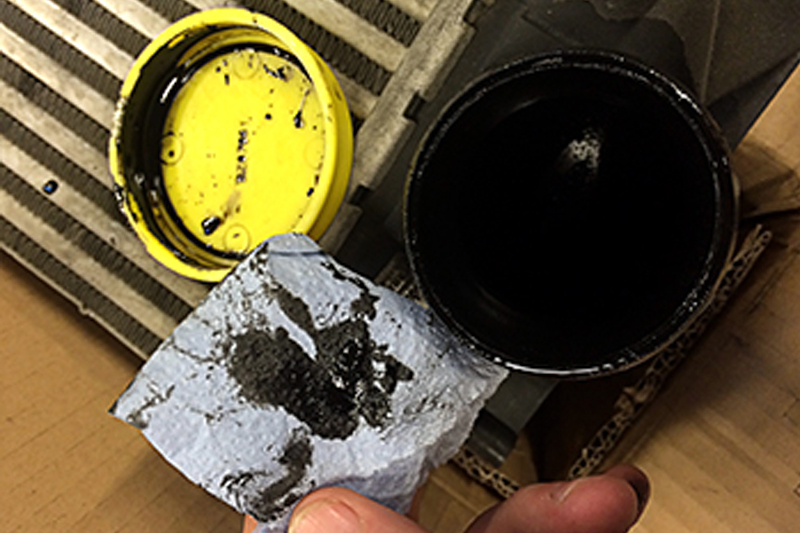 Turbo residue, especially oil, can easily clog the intercooler, but also other particles and broken off turbo parts. 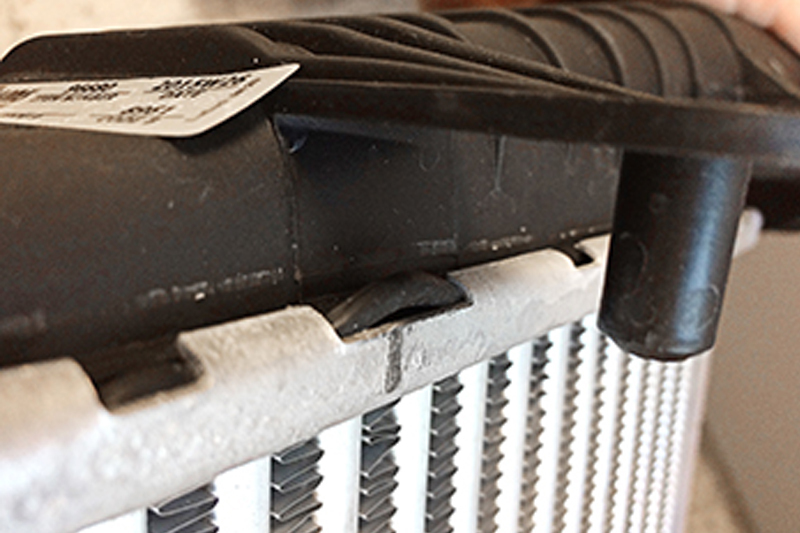 A leaking intercooler is often due to high system pressure, which can eventually cause a deformation of the plastic tank, resulting in a leaking intercooler. If residue is left in the system after an installation, there is a risk of blockage, which will cause the pressure in the system to increase. The intercooler will therefore have to withstand a much higher pressure than it was built to endure, eventually causing the intercooler to fail. The same issue can arise when the output of a turbo is manually increased. The increased pressure takes an extra toll on the intercooler, increasing the risk of the tank blowing. If a technician installs a new turbocharger without investigating the intercooler first, the system will run a high-pressure sequence, where oil and particles that have accumulated in the intercooler are at risk of being blown into the combustion chamber. If this debris enters the combustion chamber, there is a great risk of damage to the engine. Fins are destroyed due to pressure failure. This error is often ascribed to an error in the tubes. However, the excessive amount of oil on the intercooler indicates a system pressure failure. To avoid engine damage, an intercooler should always be replaced after a turbo has failed in order to ensure that the intercooler is free from any debris – such as oil, metal or other particles. When a new turbo has been installed, all system components must be thoroughly examined to ensure that they are not blocked by oil or metal debris. 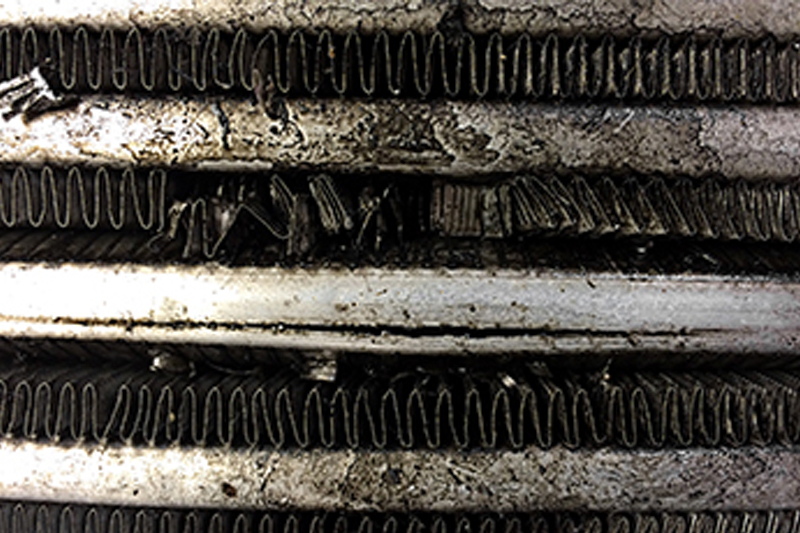 No matter what the reason for failure or replacement of the intercooler, the reason for the damage should always be thoroughly investigated before installing a new unit. The peripheral parts (turbocharger, crankcase ventilation, exhaust gas recirculation, air inlet to the turbocharger, exhaust system etc.) must be integrated in the troubleshooting process – otherwise a fault can re-occur. ■ Check air routing between intercooler and intake manifold to ensure there are no impurities/particles/blockages/reductions in cross-sections. ■ Check charging pressure with manometer gauge or your OBD connection.